As you know, I have been warning that the Transports’ strengths making higher highs unconfirmed by the other indices was a warning sign of a developing secondary reaction. Well, today it is no longer a suspicion but a certainty. Now we have to pay close attention to subsequent price action. 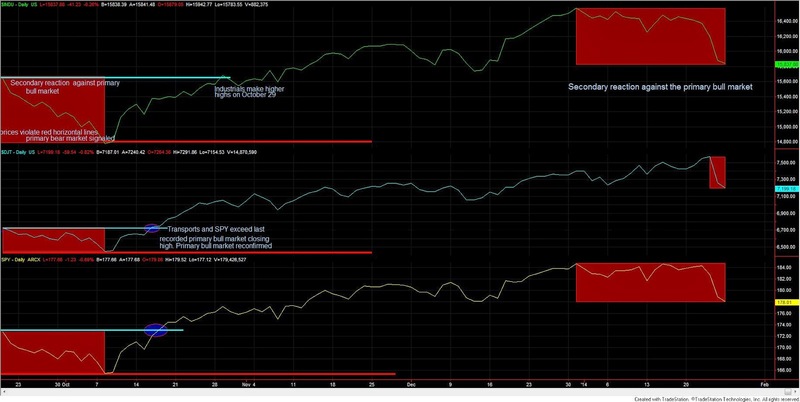 If at least one index were to rally by more than 3%, and the last recorded secondary reaction lows were to be violated, then a new primary bear market would be signaled. So today we label the secondary trend as bearish. The primary trend remains bullish, as explained here, and more in-depth here. As to the gold and silver miners ETFs, SIL and GDX closed down. The secondary trend is bullish, as explained here.